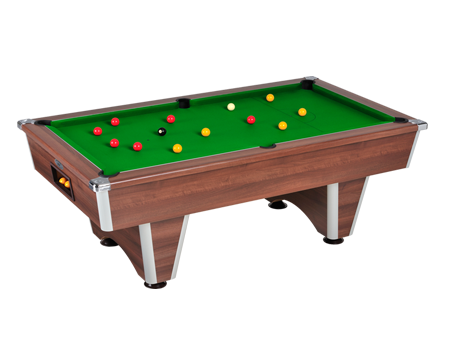 The Elite slate bed pool table is a great value addition to any home games room. The pool table benefits from an extremely sturdy design and sleek looks creating a perfect centre piece to any home games room. It has polished steel chrome corners fitted with quick drop pockets and life long pocket liners. All Elite pool tables are also fitted with a quick release top frame for installation. Here at DPT Snooker we feel we have the largest range of finishes and we have a model to fit any location. The Elite slate bed pool table is suitable for domestic and commercial locations.